This was made to bring the ol’ Cap to the new millennium. Tighter pacing, jettison what doesn’t work or slows down the movie and torpedo glaring logic holes, painful romantic chemistry and humor that falls flat. The visual success of this film deserves that first time Director Kerry Conran be showered with all manner of accolades, but the most important things that make a movie great are missing. Half of “Sky Captain and the World of Tomorrow” is a film of breathtaking vision and craftsmanship, a work of art that both summarizes the early history of cinema and takes it brilliantly, shimmeringly forward. The other half is not. Ultimately the movie is immensely stylish, fantastically retro-looking, and an utter bore. 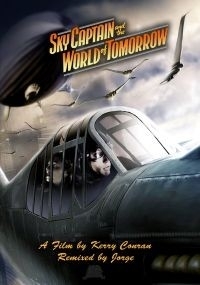 “Sky Captain and the World of Tomorrow” is based on the popular serials of the 1930s and 1940s. Written and Directed by Kerry Conran, This homage to serials is far too faithful to its origins. Conran gleefully adopts the logic holes, adolescent romantic attitudes, discontinuities and plot conveniences that were standard in movie serials because of low budgets, fast shooting schedules, simplistic scripts and the nature of their intended audience. So we get gorgeous special effects, cliffhanger action sequences as well as stilted dialogue, flat script, negligible plot, missing details, inaccuracies and a lack of continuity. Sky Captain started in the very best way a movie can: with a vision and a passion. Kerry had been making this movie for 6 years, in his computer, all CG. And he was making it all on his own. I find that kind of dedication admirable. I always want people like this to succeed with their projects, for the results of their up-late-at-night-after-work machinations to become interesting, wonderful movies. It’s too bad this one falls short of the mark. TOMB RAIDERS OF THE OZ SPACE ARK vs THE MAD SCIENTIST’S DEADLY ROBOTS ON MONSTER ISLAND! Although the movie had high box office expectations, opening at #1 on its September release date, the movie was a flop at the box office grossing only about $37 million in the United States from a reported $70+ million budget. Critical reviews, while largely positive, still didn’t drive audiences to the theatre. The film garnered positive reviews with 73% of national film critics praising the film. I guess audiences weren’t really clamoring for a painfully authentic and derivative movie serial from the 1930′s, no matter what the critics said. - Moved the opening titles to the end. Now the film starts quiet and mysterious. - Deleted The hand crossing out names. Who is that? Totenkopf’s mysterious oriental agent is a robot. She needs a list? - Deleted Sky Captain holding a gun on Polly. If you’re going to point a gun at somebody, you better shoot. - Deleted Polly being a klutz, always doing the wrong thing. Now she’s a competent reporter. - Deleted the bickering and snipping that was supposed to pass for romantic chemistry. - Deleted scenes of Dex for pacing. - Deleted any dialogue meant to be funny that wasn’t. - Deleted any dialogue were a character says “I’m going to do…” Now they just do it. - Kaji has a mind of his own. He speaks without being prompted by Sky Captain. - Added scenes from original 6 min. movie into robot sequence. 15 secs. Added tint. - Added deleted scene “Totenkopf’s Torture Room” with music from “The Ring” 1 min. 6 secs. - Reworked the end credits. New end credit sound track also RemiXed by Jorge. - Added surprise ending after the end credits. You must watch till the last frame. I liked watching the reruns of the old serials like flash gordon and king of the rocketmen. I’ve only watched sky captain once before and i have to say you have done a good job of sorting the pace. It was such a shame that i and the rest of the world didnt go to see it. I would have loved to have seen one or two sequels. The film has such a great visual style to it and your edit has tweeked it into a much better film. Thanks. Overall 4 out of 5. I’ve always enjoyed the original movie, but found it a bit quiet, for lack of a better term. It has always felt weird to me. It still does in Jorge’s edit, but less so. He did a great job trimming the fat and improving the pace. I think I miiiiiiiiight still play the original if showing it to someone for the first time (depends on the person), but this is an excellent alternate version that I would probably grab if I felt like watching some Sky Captain action. Anyway, nicely done. I give it 8/10.